25th June 2010. The National Gathering is about to begin. Have fun and drive safely! ExplorOz Blogs go Mobile. Create Blogs using your Mobile Phone. Camping Guide to the Murray River now available in the Online Shop. iPhone tutorial for updating Places on the go and see who is online using the ExplorOz Member List. The time has almost come - After months of planning, the ExplorOz National Gathering is finally upon us. For those lucky enough to be attending, drive safely and enjoy! Those unable to attend, be sure to follow the progress of your fellow ExplorOz Members using EOTrackMe. David and Michelle's trip will be visible on EOTrackMe as they head to the National Gathering in Wiluna then head up the Canning Stock Route. View their EOTrackMe Map HERE. Last fortnight we released Mobile Place updates - This week, we have taken it one step further! ExplorOz Members are now able to update their Blogs while on the road. Based on the same principle as Mobile Place updates, all you need is a GPS enabled phone (such as an iPhone, Blackberry etc) and to send your photos and text to our new email service. This new feature goes hand in hand with EOTrackMe. Family and friends can track your journey using EOTrackMe whilst at the same time viewing images and text on your Blog. And the best bit - You don't even need a computer! The following Site Tips Blog contains a step by step guide for this new service - Click HERE. 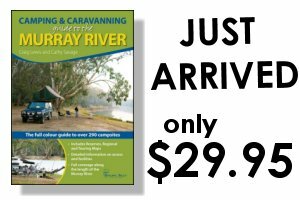 Boiling Billy Publications have just introduced: The Camping and Caravanning Guide to the Murray River which is the latest addition to their already extremely popular Camping Guide range. This fantastic resource is perfect for planning your next trip in the region. Last days remaining on Hema Navigator Packages from $990– with up to $273 of bonus items. Add aHema Reversing Camera to any Navigator Purchase for only $100 (RRP $149). These deals will only be available for orders placed before end of day Wednesday 30th of June, so now’s the time to get your order in. Did you know you can see New/Updated products in the right hand margin of almost every page on ExplorOz? These are constantly changing so check it out next time you’re on the site. Do you have an iPhone? If so, it has never been easier to keep your friends and family informed of your trip highlights. In under 30 seconds you can create a brand new geo-referenced Place, with images and description. Simply use your iPhone camera to take a shot of your location, then email it along with a description to ExplorOz - It's as simple as that. For a step-by-step guide click HERE. Curious to know what other ExplorOz members are online? Tucked away in our Members section is our Members List. This list allows you to see which ExplorOz Members are currently on the website, and what part of the webpage they are viewing. Click HERE to see who’s online now! Skydive Jurien Bay - Skydive Jurien Bay offers tandem and solo skydives, landing on the spectacular white beaches of Jurien Bay. Fishing & Boating Expo - With over 200 exhibitors, showcasing the latest in 4x4, campervans, camping, fishing and boating accessories, the expo is set to be the biggest in the shows history. The National 4x4 & Outdoors Show - Father’s day weekend is set to be a stunner with Melbourne’s National 4x4 & Outdoors Show, Fishing and Boating Expo expected to be a monumental event.